Each quilt tells a story with every stitch. 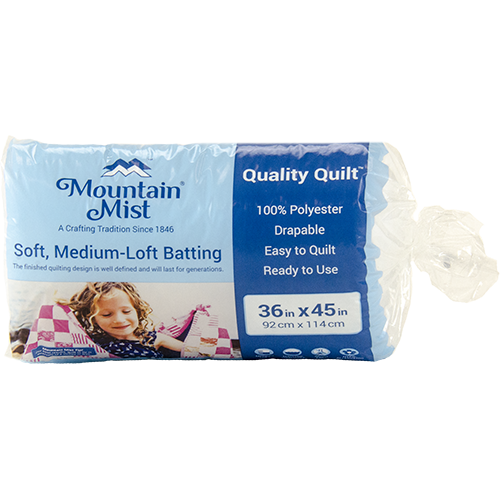 Mountain Mist’s batting story is one of meeting the needs of quilters since 1846. Explore different lofts, ranging from Quilt-Light®, Ultra Fine® (low loft) to Quality (medium loft) in our polyester option. Cotton favorites Cream Rose® needle-punch batting and White Rose® needle-punch batting, both meet the needs of the hand quilter and machine quilter with it needle glide finish. Depending on the hand, drape and stitching relief wanted, we have a batting to meet those requirements. For machine quilting and batting by the yard we offer our every popular Comfortloft®. Build layers of the Comfortloft batting to the thickness desire. Our Super Fluff® Roll batting ranges from loft of 5/8” thick to 1 ¼” thick, and fulfills the desire for a thicker warmer quilt. Whether choosing a pre-cut package option or, by the yard option, each Mountain Mist batting is made to enhance the finish appearance of each quilt.